I’m taking the day off today to introduce you to my friend Katie. Katie and I met at the Dole Summit this summer. She a super nice person and a talented cook. We’ve been discussing guest posting on each other blogs for several months, and I finally got my act together and followed through. Speaking of which, after you check out Katie’s delicious recipe, pop over to her blog Sweet and Sour Chronicles and check out my post. Hi there – I’m Katie Chin with the Sweet and Sour Chronicles. 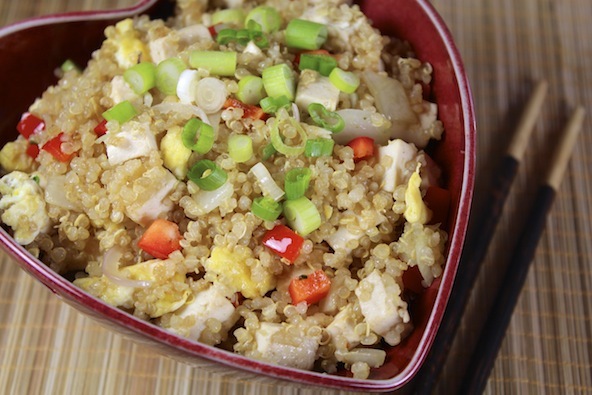 Although this recipe isn’t really fried “rice”, it is prepared just like authentic Thai fried rice, but instead of rice I’m using quinoa (pronounced keen-wah). If you didn’t already know, quinoa is truly a super food. Not only is it low in calories it is a complete protein, meaning it contains all 9 essential amino acids. It’s also rich in lysine, iron, magnesium, vitamin E, potassium, and fiber. Who knew? Although it’s actually a seed it’s prepared like a whole grain and has a slight nutty taste. I love quinoa, but as you may know, it can be a bit bland; but it’s easy to punch it up as it absorbs the flavors around it much like tofu. I decided to marry some quinoa with the salty, sweet, sour and hot flavors found in Thai fried rice and it was a match made in heaven! In a medium bowl, whisk together eggs, 1 teaspoon of the salt and pepper. Heat ½ of the oil in a wok or skillet over medium heat. Cook eggs, stirring, until set but still moist. Transfer eggs to a plate. Wash and thoroughly dry wok. Heat the remaining oil over medium-high heat. Add garlic and shallots and stir-fry until fragrant, about 1 minute. Add quinoq and stir-fry for 2 minutes. Add fish sauce, soy sauce and palm sugar and stir-fry for 2 minutes. Add red pepper and tofu and stir-fry for 1 minute. Add reserved eggs, chili sauce and cilantro and stir-fry for 30 seconds. Dish out onto serving bowl and garnish with cilantro and green onions.